This is a really fun part of interior decorating! All of the elements and principles of design that we discuss are incredibly important. Yet, they don’t always provide as much creative excitement as the act of making just a couple of elements in a room stand out. The concept of emphasis is defined as an element in a composition that catches the viewer’s attention. In home design this is a feature that initially attracts attention and encourages viewer to examine it more closely. In other words, it’s the “wow factor!” Even though it often outshines the elements that surround it, it relies heavily on a combination of factors in order to be effective. Examples of elements that can contribute to emphasis are lines, color, and texture. The room above is a marvelous example of emphasis because it deftly incorporates more than one focal point. A feat not easily achieved! First and foremost the spectacular view is the main focal point. While it may seem like this is accomplished without further thought, in fact it is enhanced by the clean simple lines of the window frame. They’re brown which alludes to nature and they offer little more than basic rectangles through which to view the outdoors. No distractions. The last area of emphasis is the unique ceiling. The circular forms are quite unexpected but they serve well to bring the room “back inside.” Otherwise our gaze may become stuck on the outdoors. 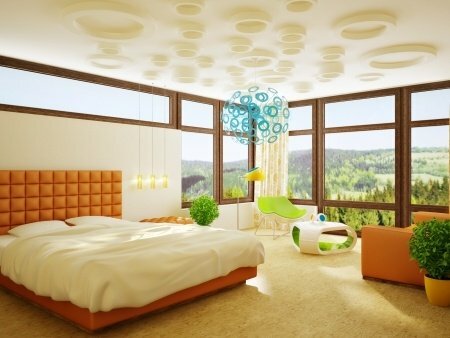 If you were standing in the room you would naturally look outside, but then look up and search out all of the circular forms that ultimately bring you focus back into the interior of the room. It could be suggested that the bed is also a focal point, but in this case we feel its purpose leans more toward establishing balance on both sides of the room. Our primary advice when trying out these methods of emphasis is to not be afraid to mix and match. With a little creative control, you can certainly create a room that has wow factor all over the place!